Instructions: Click here to view a larger photo of this project. **Please note: My instructions are based on the dimensions of the chocolate bar I used. You will have to tweak measurements based on the dimensions of different bars. Cut the white cardstock base to 7.25 x 11". Pick one end to start scoring from. Score at the 2.75" mark, go in 3/8" and score again, go in 2.75" score, 3/8" score and 2.75" again, score. There should be another little flap left. The paper for that leftover flap is to be cut to 1.75 x 7", from yellow patterned paper. The mini strips of paper for the sides are 0.25 x 7", you will need 2 from the polka dot patterned paper. All other sections are 2.5 x 7", 3 pieces of blue polka dot and one of light blue patterned paper. For all of this I used a good strong adhesive, my E-Z Runner Ultra. Adhere the narrow strips first, onto the outer sides. Cut a lengthy piece of the tulle ribbon and adhere it to the 2 outer sides of the paper, then add the patterned paper on top of the ribbon. Find and die cut out one of the mini tags, add a bow of burlap string to the top and attach to that inside mini flap. Add the blue polka dot patterned paper to all of the other sections. I used glue dots to attach the chocolate bar to the cardstock. Cut the button border strip down to 7" long and adhere across the front of the piece. Die cut "A Gift For You" from navy cardstock. Cut the decorative tag from white cardstock, and the slightly larger piece from navy cardstock. Adhere these layers together using 3D foam squares. Add green pearls as accents. Adhere to the front of the project using 3D Foam Squares. Stamp and die cut 1 set of the medium flowers using Spiced Marmalade ink onto white cardstock. Add color to these images using the same ink and daubers. Stamp and die cut 1 set of the small flowers using Berrylicious ink onto white cardstock. Add color to these images using Candy ink and daubers. Stamp and die cut 1 of the swirly Leafy Accents using Seaweed ink onto white cardstock. Add color to these images using Green Apple ink. Shape all of these images using the 3D Floral Basics and 3D Leafy Accents Shaping Molds. Stamp and die cut a set of the buttons in Sailboat and Broken China. Add liquid adhesive on top of the chosen buttons and let dry for a shiny dimensional look. 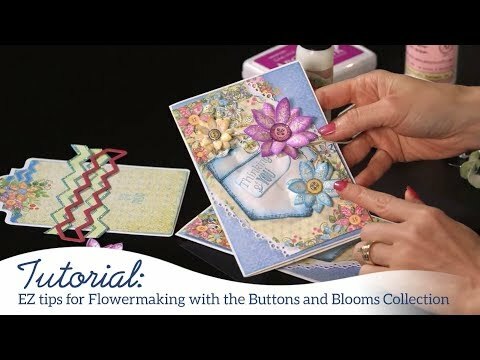 Assemble the flowers and add a button to the middle of each. Adhere to the card using Adhesive Dots. 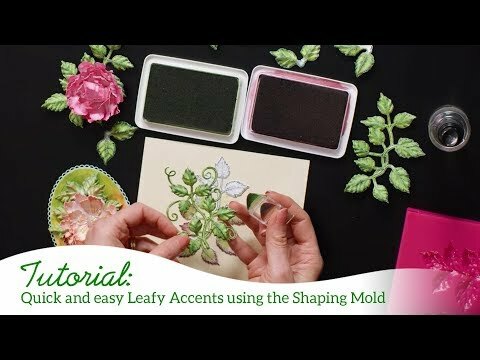 Add the leaves in pieces around the flowers, again using Adhesive Dots. Tie the gift card using the tulle ribbon and your gift is complete.